Any lights on the dash lately? You may be running around for now but it will let you down. All makes and models tested and diagnosed if we cannot read a code there is no charge! We have all the latest diagnostics equipment and software to find the most troubling problems. 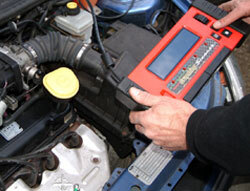 We can test your vehicle for emissions related problems on our four gas analyser.